Brian Elliott makes a save on a shot by the Capitals' T.J. Oshie during the third period. WASHINGTON – For the Flyers, their season is ending the way it started — with too many losses. The Flyers played much better than they did the previous day, but their late-season fade continued Sunday afternoon as they dropped a 3-1 decision to Washington at Capital One Arena. After having one of the NHL’s best records for a stretch of more than two months, the Flyers have lost five of their last seven games to fall out of the Eastern Conference wild-card race. That’s more regulation losses than they had in their previous 24 games, when they went 18-4-2 to climb into the playoff hunt. Braden Holtby made 35 saves to key the victory for the outplayed Capitals. “That’s a story line we’re privileged to have sometimes — when we’re not at our best, we’ve got one of the best, if not the best in the league, back there making up for some of our mistakes,” said Washington right winger Tom Wilson, who gave the Capitals the lead for good with an early goal. The Flyers’ tragic number for playoff elimination fell to five points — a combination of points Philadelphia fails to gain, and points Montreal does gain — with six games left. The Flyers are eight points behind the Canadiens, who lost, 2-1, in overtime at Carolina on Sunday night. 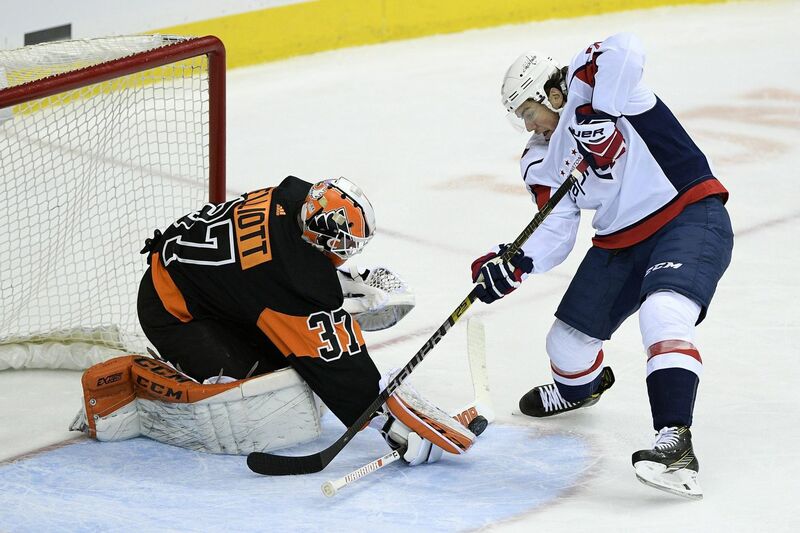 The Flyers finished 0-4 against the defending Stanley Cup champion Capitals, the second time they were swept in the series since Washington joined the league in 1974-75. The Caps also won all four games in the 2006-07 series. In this year’s series, the Caps never trailed at any point in the four games. The Flyers showed a lot more energy — and had many more quality chances — than in their listless 4-2 home loss Saturday to the Islanders. They outshot the Capitals, 36-30, and had a 74-47 advantage in shot attempts. Early in the third period, Holtby made two key power-play saves on Jake Voracek (six shots) to keep the Capitals ahead, 2-1. He then made a nice stop on a ticketed drive by Oskar Lindblom after the power play had expired. With 11:53 left, defenseman Phil Myers couldn’t keep the puck in the offensive zone and Brett Connolly fed Jakub Vrana, who scored on a breakaway to put the Caps ahead, 3-1. The Flyers dominated the second period and, while on a power play, finally solved Holtby as Voracek scored from a bad-angle shot from deep in the right circle near the sideboards. It was Voracek’s 20th goal and it sliced the Caps’ lead to 2-1 with 2:50 left in the second period. The Flyers, who had a 20-7 shots advantage in the second period, had peppered Holtby with seven straight shots before the Caps took advantage of a Sean Couturier turnover and took a 2-0 lead midway through the stanza. Fourth-line center Travis Boyd scored on a deflection of Matt Niskanen’s shot for his first goal in 25 games. Brian Elliott (27 saves) had denied Andre Burakovsky and Connolly on separate two-on-ones earlier in the second period. Wilson had given the Metropolitan-leading Caps a 1-0 lead when he deflected Nick Jensen’s drive past Elliott with 16:08 left in the first. It was Wilson’s fourth goal in four games against the Flyers this season. “The last two months were like the playoffs for us," Giroux said. “We believed we could make the playoffs. We put ourselves in a position to make the playoffs. The last few weeks, it hasn’t gone our way."